Click on a link below to show an answer - and click it again to hide it. 1) Please accept this complimentary gift, on behalf of www.wepss.com. (There will be included an 8 digit test code.) Or you may receive your test code from the person who requested you take the WEPSS. In order to take the WEPSS test, you must FIRST REGISTER for a free account. Go to www.wepss.com and click on the word REGISTER. There you will be asked to enter your e-mail. 2) You will then receive an e-mail validation asking you to Click Here to continue with your WEPSS.com account registration. These steps are necessary to make sure the results go to the correct e-mail address. 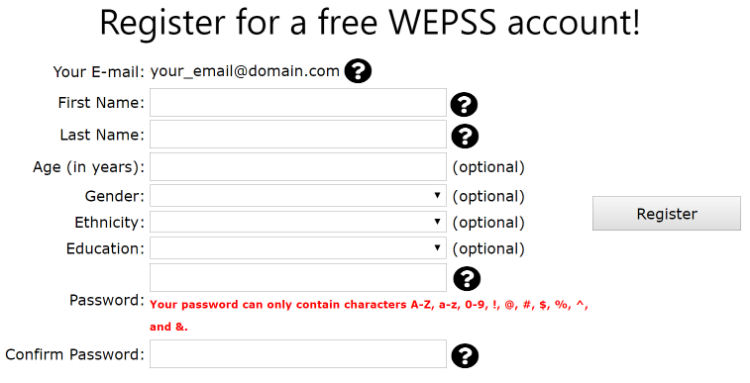 3) Register for a free WEPSS account! Your e-mail address will already be filled in. Fill in the rest of the information requested and make up your own password. This is not the same as your test code. You put in your 8 digit test code when you get to the test itself. 4) Once you fill out your account information, click the Register button. You will then receive an e-mail telling you your Registration is Complete. Please Log In to access your account. Click the Log In. 5) You will now be on your Account Details page which includes your personal information and test code. Where it says: Logging in to take the test? Click Here! Click that and you will arrive at the test itself. 6) There you will be asked to enter the Test Code you received in your e-mail. It’s best to copy and paste the code since sometimes O looks like 0 and capital I (eye) looks like lower case l (el). There are 200 items. You cannot go on to the next item until you answer the current item. The definitions of the words can be found by putting your cursor over the word. The test runs out of time after an hour and a half. So you need to complete the 200 items at one sitting in less than an hour and a half. Otherwise your answers aren’t saved and you have to go back to the beginning. When you are finished taking the inventory, click submit and you will receive your test print-out in your e-mail or it will go to the e-mail of the person who sent you the test code, if that is what they requested. If you click submit twice, you may get the error message that the test code has already been used. Actually it was just used by you. Why is my test code invalid? Sometimes, it is easy to mistake characters - commonly, an uppercase 'i' can be mistaken for a lowercase 'L' or the number 1 (I l 1) or an uppercase 'o' can be mistaken for the number zero (O 0). We recommend that you use your mouse to highlight and then right-click and 'copy' the test code in your email program, and then when you go to https://www.wepss.com/test.asp to take a test, right-click on the testcode field, and 'paste' the testcode value into it. Why are many of my highest scores almost the same? Individuals often identify with several of the Enneagram styles. Sometimes another high score might be your wing or neighboring style - the one next to yours on the Enneagram circle. Sometimes another high score might be a look-alike type. For example Fives and Nines may look alike because both tend to detach and move away from the situation. Fives might be more hyper-alert, withholding, and tightening of their boundaries ; whereas Nines might be more distracted, merging, and loosening their boundaries. You might need to read and reflect on fuller descriptions of your highest scores. Expanded descriptions can be found under “Enneagram Styles” on Dr. Wagner’s www.enneagramspectrum.com website. You might also spend a day or a week trying on your highest styles and see which one fits best. Act "as if" you were that type. You might find that for one of the styles, you don't have to act much at all! My second highest score isn't my wing style or either of the styles where I shift under balanced and stressful conditions. This second highest score might be a look-alike style. For example Ones and Sixes are both responsible, conscientious, and like order and structure. However Sixes might be motivated more by fear; while Ones are energized by anger. One might look to their inner authority for the right answer; while Sixes look to external authority for the proper response. The next highest score might be the style of one of your parents. We spend a lot of time imitating our parents and then try not to be like them. Or your second highest score might be a style that you need to use for your work or career. Perhaps your work requires you to be exact and on time and so you are drawing on the abilities of your inner One. All of my scores are low. Hardly any are above 50%. Sometimes people don't identify very strongly with any of the Enneagram styles. Perhaps another personality typology might fit you better. Or you may have a mind-set that tends to understate or underestimate. That is, you answered the items consistently in the hardly ever or seldom fits me range. Or, perhaps, you didn't want to stand out on any style. You may have had a defensive mind-set when you took the inventory and didn't want to reveal too much about yourself. So you kept a low profile, figuratively and literally. Most of my scores are high. Many are over 90%. To get scores that high means you answered most of the items in the frequently or almost always fits me range. Perhaps you have a mind-set that over-states or overestimates yourself. Sometimes people are just feeling passionate about their lives and so endorse the items with gusto. Read the descriptions of the types you scored highest on and see if one or two of them describe you the best. What do the percentile scores mean? The 50-85th percentiles are in the range of sometimes fit me. The 15-50th and 85-95thpercentiles are in the ranges of seldom fit me and frequently fit me, respectively. While scores below the 5th percentile and above the 95th percentile approach the categories of almost never fit me and almost always fit me. For the statisticians, the 15th and 85th percentiles are one standard deviation away from the mean (50). The 5th and 95th percentiles are two standard deviations away from the mean. My highest raw score is not the same as my highest percentile score. Shouldn't the heights of the raw scores be the same as the heights of the percentile scores? Not necessarily. Converting raw scores to percentile scores puts all nine scales on the same statistical footing. For example if 1000 people take the test, it might turn out that the mean raw scores for Styles One and Two are 5 points higher than the other scales. By converting the raw scores to percentile scores, all the scale means are the same - 50th percentile. Also you know where your scores stand compared to the standardization group. So even though your raw scores might seem low on the Style Eight scale, for example, when you convert them to percentile scores and compare them to other folks who have taken the inventory, your scores might turn out to be higher than everyone else's. In general percentile scores are better for reliability, validity, and predicting than raw scores are. I identified with the Resourceful characteristics of most of the styles and not with the Non-resourceful characteristics. Does that mean I'm healthy? Hopefully so. It may mean that you have worked through the exaggerations and distortions of all the styles and have arrived at an integrated balanced state in your life. Or it may mean that your image of yourself, your self-concept, is more positive, robust, and balanced than you really are. There may be some lack of congruence between who you think you are and who you actually are. This is like addressing the mirror on the wall and asking: "Mirror, mirror on the wall, who is the fairest of them all?" And the mirror replies: "Why you are, of course." If you endorse the resourceful items more heartily than the non-resourceful items, you will come out on the positive side. The test only tells you what you tell it. You might want to check out your results with people who know you well and who will give you honest feedback. Or it is possible that you know this inventory is being used to evaluate you or you are using it to evaluate yourself and you want to present yourself in a positive light and so you want to come out looking good. The WEPSS tells you what you answered; it doesn't tell you why you answered that way. I identified with the Non-resourceful characteristics of most of the styles and not with the Resourceful characteristics. Does that mean I'm neurotic? Hopefully not. But, perhaps, so. The Non-resourceful items measure the distortions and exaggerations and rigidities of the styles. If you scored high on the Non-resourceful characteristics, you may want to back off from and tone down your style a bit. For example, you can keep your passion for excellence but ease off the perfectionism, if you are a Style One. Or you may want to balance your style with some features of other styles. For example if you find yourself withdrawing and withholding in the manner of a frugal Five, you might want to express the generosity of your inner Two or the assertiveness of your inner Eight. The directions for taking the WEPSS suggest that you put on the mind-set of how do these words and phrases describe you over long periods of your life. This helps you see your style more clearly. However, these days you might not be as invested in your style as you were when you were younger and so you may be more resourceful now than you were in your youth. You may have mellowed and balanced out. So your scores may be truer of you in the past and less descriptive of you now. Perhaps you are being unduly honest about yourself or exceptionally critical of yourself. This would elevate your Non-resourceful scores. You might not be as bad as you think you are. There may be a discrepancy or lack of congruence between who you think you are and who you really are. This is like addressing the mirror on the wall and asking: "Mirror, mirror on the wall, who is the worst of them all?" And the mirror replies: "Why you are, of course." It's possible that you might be going through a hard time in your life when you took the inventory. So the test is measuring what you think about yourself when you are very stressed. When you are feeling better, your Resourceful scores might bounce back. It's also possible that you are feeling distressed and the high Non-resourceful scores are a way of asking for help - either from your inner guide or from an outer counselor. Again, the WEPSS tells you what you answered; it doesn't tell you why you answered that way. My highest score was Style Six. How do I know if I am a fearful Six or a counter-fearful Six? Good question. Some Sixes are inhibited by their fears. They want to do something; their fears arise; they don't do it. Other Sixes are propelled by their fears. They are afraid and they do the very thing they are afraid of to get past the fear. For example a fearful Six who is afraid of heights will take the train. A counter-fearful Six who is afraid of heights will take up sky diving. Fearful Sixes tend to be more timid and security minded; counter-fearful Sixes tend to be more aggressive and adventuresome. The WEPSS doesn't have separate scales for fearful and counter-fearful Sixes. So you have to look at your overall profile. If you identify more with the gentle styles like Two, Nine, Five, Four (the types that move towards or away from people and situations), you might be a fearful Six. If you identify more with the more assertive and adventuresome styles like Eight, Three, One, and Seven (the types that move against the situation or want to experience everything), you might be a counter-fearful Six. Or, like other ambivalent Sixes, you might find yourself reacting fearfully in some situations and counter-fearfully in other situations. When in doubt, vacillate.